I've been pretty slow on the detail work on this one - things have been busy around here. I have had to go back to my "be satisfied with 15 minutes" mentality, and bit by bit I am accomplishing something. As you can see, I am working on the tractor now. I will get it completed, and then see how much further detail is needed in the landscape areas. The tree for sure is not completed yet, and the fence posts look a little lonely without barbed wire. Because I drew it so carefully, painting the tractor is a bit like paint-by-number. I paint one section at a time, the color it looks in my reference picture. There's a lot of almost-black shadows too, that mean I can get away with just hinting at shapes in the shadows. I have no idea what all those exposed engine parts and wire are, and so I am freed to be more accurate - I'm not painting an engine, but a combination of different shapes. I wish I could detach from other subject so easily - it's hard to right-brain over into translating painting and drawing subjects as a combination of shapes rather than "man," "dog," "flower." It took a few mixtures to figure out a good combination of pigments to make rust. 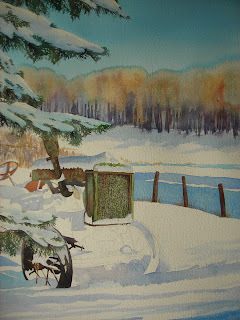 I am using mostly burnt umber and cadmium red dark, with a bit of the green that I am using for the tractor paint. I can't give an exact color recipe because I find a color rings truer if it has a little bit of everything - usually obtained by pulling in color from the muddy puddles at the edge of the palette wells. I usually clean my palette wells when I start a new painting, and then not again until the painting is done. That way, even when I start a new painting session, and mix up a new pool of pigment, it blends in with the residue from my last session, and there's a consistency of color throughout the piece. A watercolor painting also maintains a consistent look by incorporating the same colors throughout. 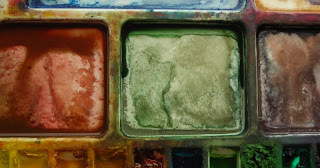 When I mix the rust pigment, I either mix in some of the tractor green right into the palette, or drip it in wet-in-wet to the area I have just painted rust. The blue of the shadows is very different from the greens and browns of the rest of the painting, but they also are included in the mixed colors - when I darken a color for a shadow area, I use the same blue that made up the sky and the shadows on the snow. Maybe this doesn't matter as much for other painting subjects, but in landscapes and florals, a consistency of palette makes the painting ring more true to life.